These were a surprise for me this morning, I have a dozen emails from some very worried visitors to Jihadwatch.org. 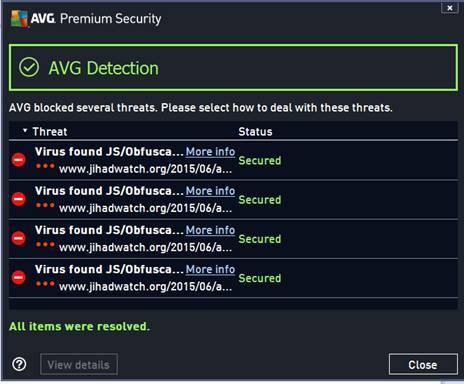 13th June 2015 UPDATE: It looks like it was only Avast and AVG who got it wrong, they have since whitelisted JihadWatch as clean, with no explanation or apology for the original blacklisting. 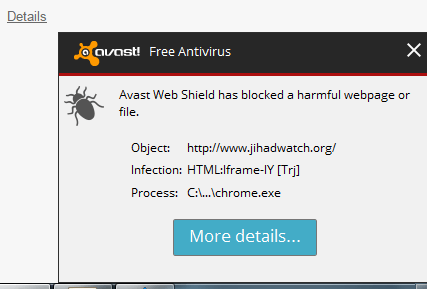 19th June 2015 UPDATE: Avast are again wrongly listing Jihadwatch.org as being infected. 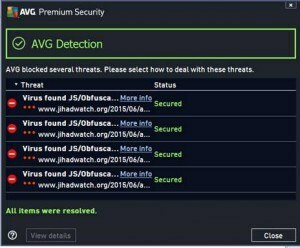 You can report false positives to Avast here: avast.com choosing report false virus alert.